We are Ken and Annette and we live in the beautiful Okanagan, centrally located in Kelowna. 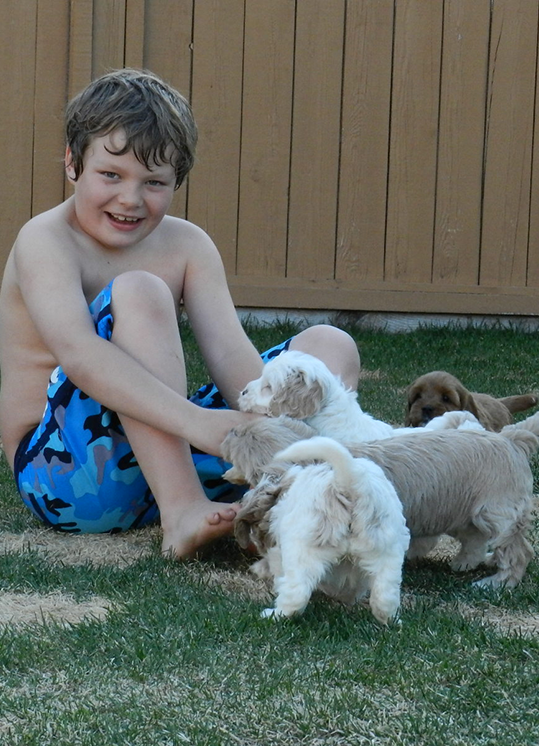 We have recently moved to Kelowna from Prince George, where I started my breeding program. We started Puppy Patch 7 years ago with just two fabulous doodles. Seven years later, I have over 20 breeding girls and boys that all live in loving forever homes. Our puppies are all raised in our home, our breeding dogs (while at our home) are sleeping with us and spending every moment doing what we do! People call us crazy (they might be right), but we know we are super lucky to have doodle love everyday. My husband works construction when the puppies can be managed by just me. We do have a busy home though, with 3 children, 3 full-time dogs and of course all the puppies! Although busy very normal with our dogs, our children, their schooling, sports and of course day-to-day life. Our children are actively involved with raising our dogs, spending time playing with them, training them and cleaning up after them. Dawson, age 17, is a genuine teenage. He has decided to pursue his education once graduated in business….boy that excites me! I can’t wait to have the help! Kaitlyn, who is now 13…a teenager…eeek. She keeps me on my toes but still enjoys the everyday tasks of feeding and watering the animals with the reward of having them sleep with her in her bed. She loves all animals and it shows. She has her share of animals, two cats, , two parrots, a horse, and she just convinced me to keep one of our new Bernedoodle girls. Kaitlyn has a passion for art. She is often painting, crafting, making face masks. She’s not the tidiest crafter so it is not my favorite choice for her. She does love her new sport hockey and she is going to try basketball this spring too. My youngest is Landon who is 11 years old and he loves to be busy….always! He is great at entertaining the puppies and is the most helpful with puppy chores. He loves hockey, basketball, golf, fishing and baseball. Landon is off to Middle school next year but he promises me to always be kind to me and love me uconditionally! Dogs come into our lives to teach us about love, they depart to teach us about loss. A new dog never replaces the old dog, it mearly expands the heart! We moved to Kelowna in March of 2017, two years ago now, wow, time sure does fly by! We absolutely love the Okanagan and feel so grateful to have had the opportunity to relocate to such a gorgeous place. Although we don’t get away often as you may have guessed, but we do enjoy the hiking and biking Kelowna has to offer. We live a half block from the beach so the water is big part of our lives in the summer months. Being that we are just a 3 hour drive to Vancouver we can get away occasionally for road trips, we all enjoy a good NHL hockey game. We also love our indoor time too, having movie nights or a hockey game snuggling up on the couch. Whatever it may be our pooches are always with us. Our Puppy Patch has been expanding over the years. Almost all of my beautiful dogs are living in wonderful Guardian homes. Living with us, in our home we have our Tillie, our F1 Standard Goldendoodle, Lulu our Australian Labradoodle, both who are retired now. We have just taken on our first Bernedoodle, Kodak, who will part of our program when she is ready. My breeding dogs are bred 3 or 4 times, then they enjoy retirement life with their already forever home. Each one of my breeding dogs is sent off in to amazing hands, with a ton attention, training and of course love! I am 100% confident that you and your family will feel the same way about your Doodle as we feel about ours!